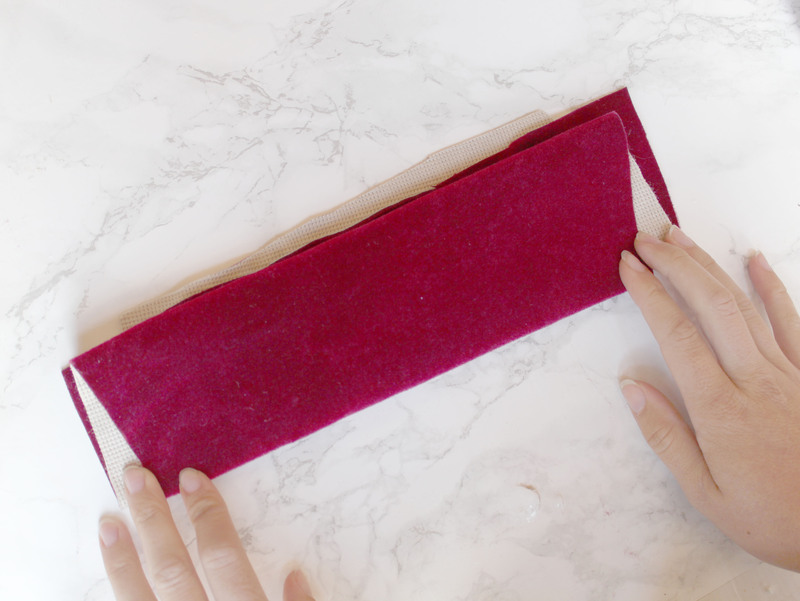 I’m always on the look out for ways to make rag rugging quicker and easier. Over the years, I’ve discovered a number of tricks and “hacks” that save both time and effort (you can read some of my rag rugging hacks here). Without a doubt, one of the most time-consuming parts of rag rugging is the cutting up of the fabric – you’d be surprised how much fabric a rag rug eats up, particularly in the shaggy rag rug technique. Although I actually find this part of the process quite relaxing, sometimes I just want to get on with the actual making itself. So, when I saw the Workzone Cordless Cutter in Aldi, reduced from £14.99 to £9.99, I thought I’d give it a go and see whether it made cutting process any easier. This video shows how I normally prepare my materials and below is how the Workzone Cordless Cutter compared…. This is one of those obscure tools that I never even knew existed… did any of you? I never would have tried it if I hadn’t stumbled across it in Aldi (they’ve got some very odd bits in those central baskets). 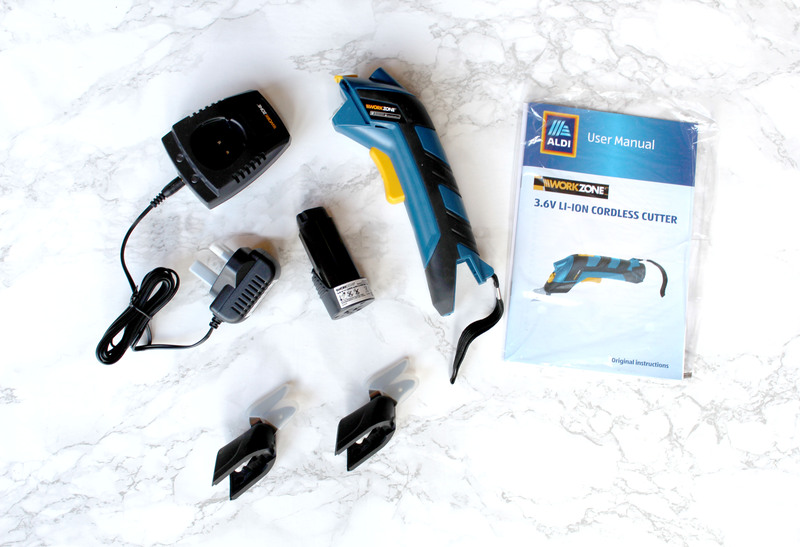 According to the box, the cordless cutter is ideal for “cutting leather, cardboard, wallpaper, fabrics, tarpaulins and much more”. 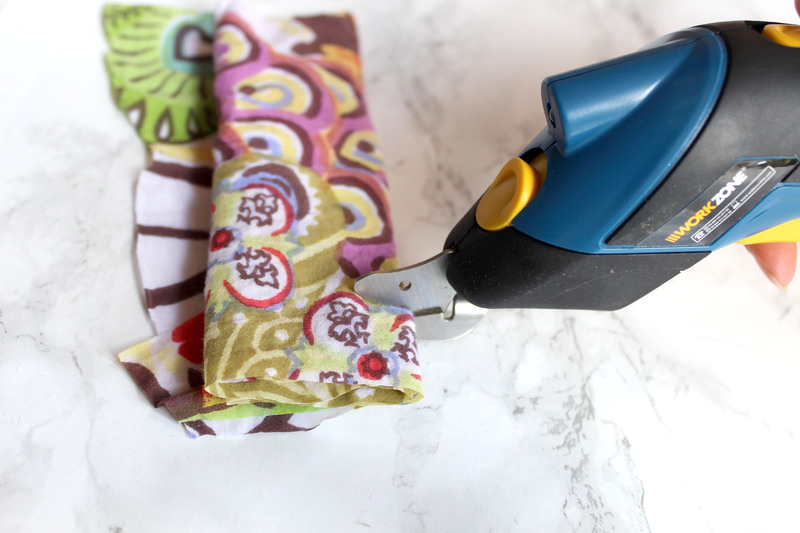 That’s a pretty bold claim considering some of those materials are pretty darn thick… It got me intrigued and I decided to test it out – would it make cutting the strips for rag rugging any quicker or easier? Here you can see what came with the Workzone Cordless cutter. 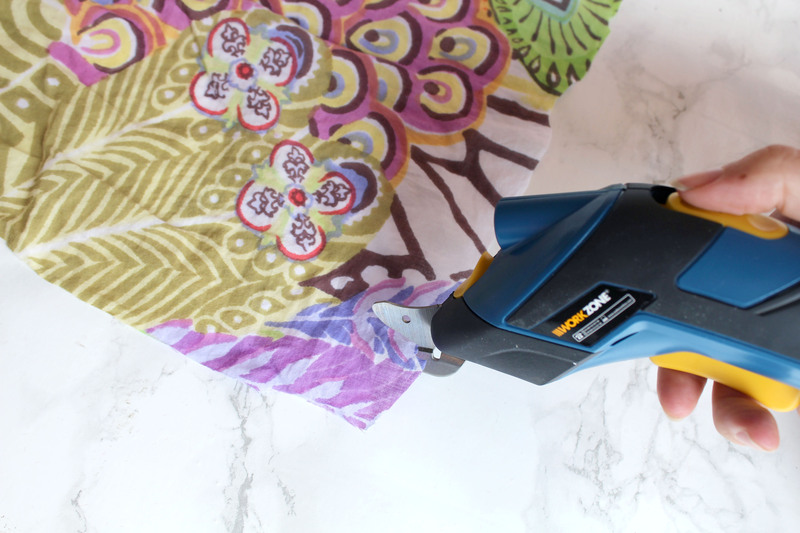 We warmed up the cordless cutter with easy chiffon. Testing the cordless cutter with folded fabric. Firstly, we tested the thick curtain material with our Ragged Life Rag Rug Scissors to get a benchmark. The scissors could cut through twelve layers comfortably and sixteen layers at a push. How would the cordless cutter fair? We moved onto cutting the curtain fabric. The cordless cutter made it through one layer of the fabric absolutely fine, but the noise was starting to get pretty annoying at this stage. It sounds a bit like a loud blender. But, we kept going and tried the cordless cutter with the curtain fabric folded up (only four layers thick). We folded the curtain fabric to see whether the cutter would work with multiple layers of a thick fabric. The Workzone Cordless Cutter began to encounter a few problems at this stage. It was quite difficult to cut through multiple layers in a straight line as the resistance of the fabric caused the cutter to go wonky. This was slightly unnerving as we weren’t entirely sure what would happen when the blade came into contact with fingers. When you rag rug with thicker materials, you generally need to cut the strips narrower to make them easier to pull through the hessian. This was quite difficult to do with the cordless cutter and we decided not to try folding more layers… we valued our digits too much. So, we moved onto our last fabric… denim. 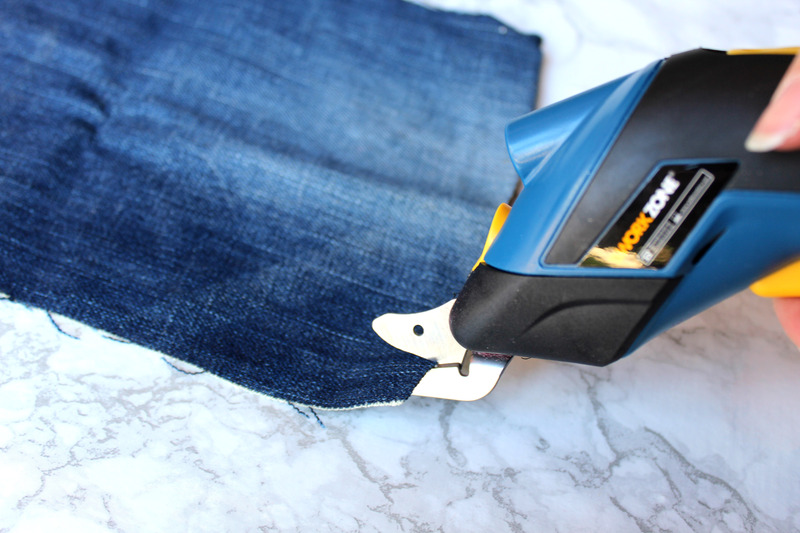 We selected a thick, stiff denim to work with as we really wanted to put the Workzone Cordless Cutter through its paces. Firstly, we tried the tool out cutting through just one layer. 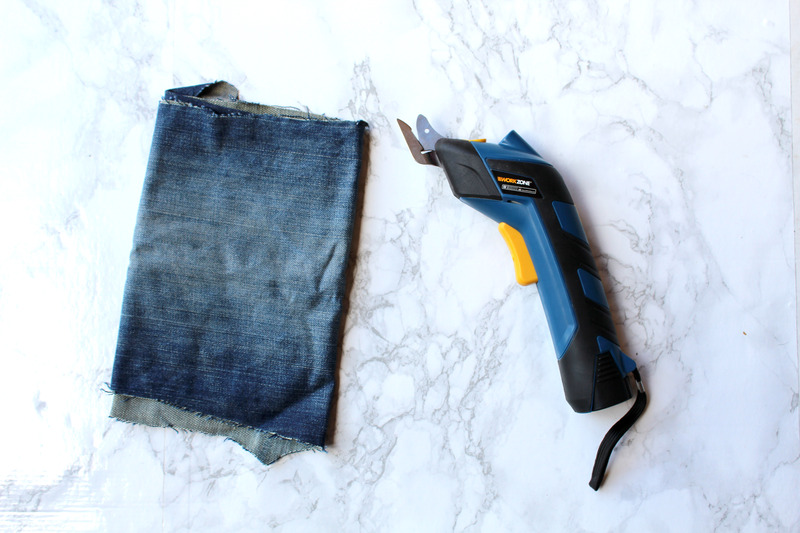 Firstly, we tried the tool cutting through one layer of the denim. Next, I folded the denim. We experienced the same problems that we’d had earlier with the folded curtain. We were a worried about getting the cutter too close to our fingers as we had to move a hand up the material, alongside the cutter (whilst still cutting). This was needed to keep cutting in a straight-ish line, and to stop it from unravelling part way through, but meant we were constantly in fear of chopping fingers. What’s more, the blade on the cutter began to wiggle a bit unnervingly at this point. Click below to see a video of the Workzone Cutter in action, but be warned, it’s noisy! 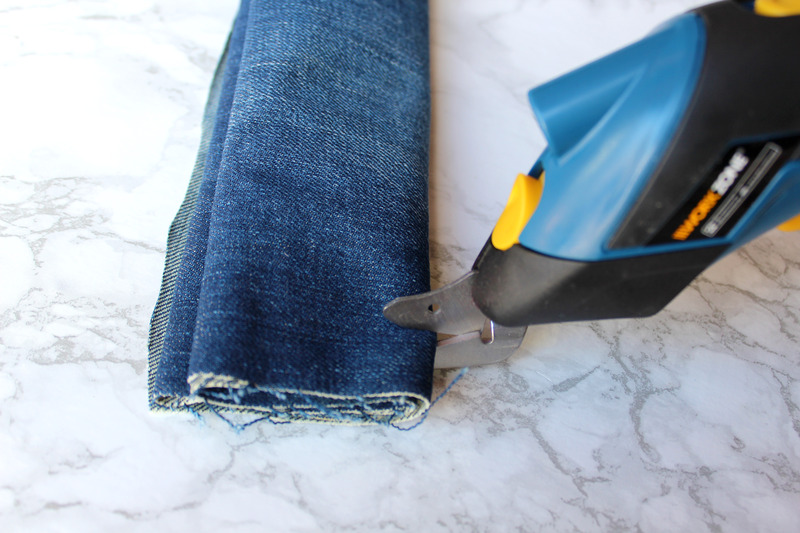 In short, we worked out that you could probably cut through up to six layers of thick denim with the Workzone Cordless Cutter, but no more. It was difficult to cut the strips as narrow as we would have liked, which would obviously cause problems when it came to the actual rag rugging itself. 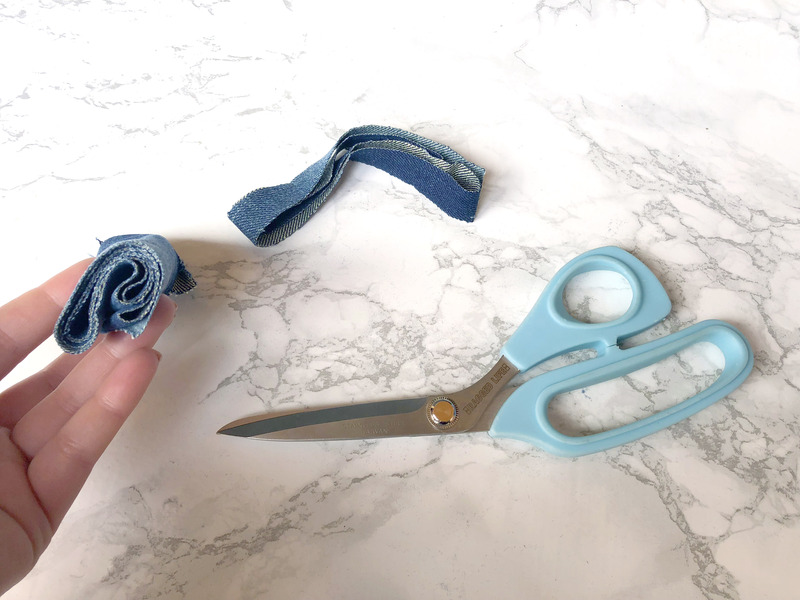 We’re pretty certain rag rug scissors or good quality fabric scissors would be easier to use if you like to fold your material when you cut it for speediness. We managed to cut through lots more layers of the denim when using our Ragged Life Rag Rug Scissors. With the cordless cutter, you don’t need to exert any force, which means your hands probably won’t get tired as quickly as with other cutting methods. The cordless cutter seems to work with all manner of different materials ie. pretty much anything that would be used for rag rugging. There’s not much hassle with it (as there can be with other tools branded as ‘easy to use’). The tool cut through one layer of material easily. It is cordless and therefore transportable. There aren’t many parts to it when you take it out the box, and so it’s easy to set up and no complicated instructions are needed. The cost! The tool is very cheap, I was pleased to pick it up for a tenner. The noise! The cordless cutter makes one helluva racket. There is absolutely no chance of watching the TV or listening to an audiobook while using it. It’s so loud that you’ll quickly make enemies of your neighbours. You’ll probably need to use this tool with a table, which means it’s not as portable as scissors. I like to sit in front of the TV rag rugging and this isn’t something I’d feel comfortable using on my lap. 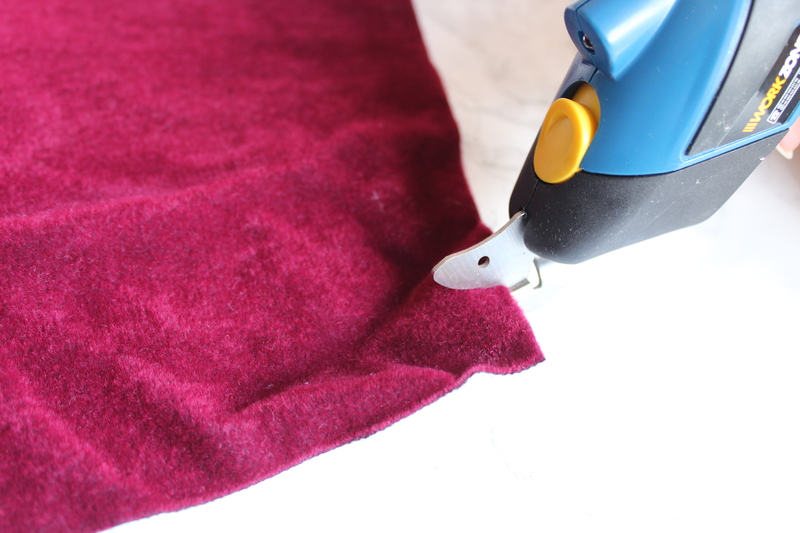 It is quite difficult to cut strips thinly with the Cordless Cutter, particularly when using thicker fabrics. It becomes a bit unnerving when the cutter is getting closer to your fingers and you feel like there’s less control than with other methods. You wouldn’t be able to completely substitute this tool for scissors because it is very difficult to manoeuvre around seams and hems. The fabric has to be even and flat for best effect, and it would be hard to cut accurately in any other direction than straight. 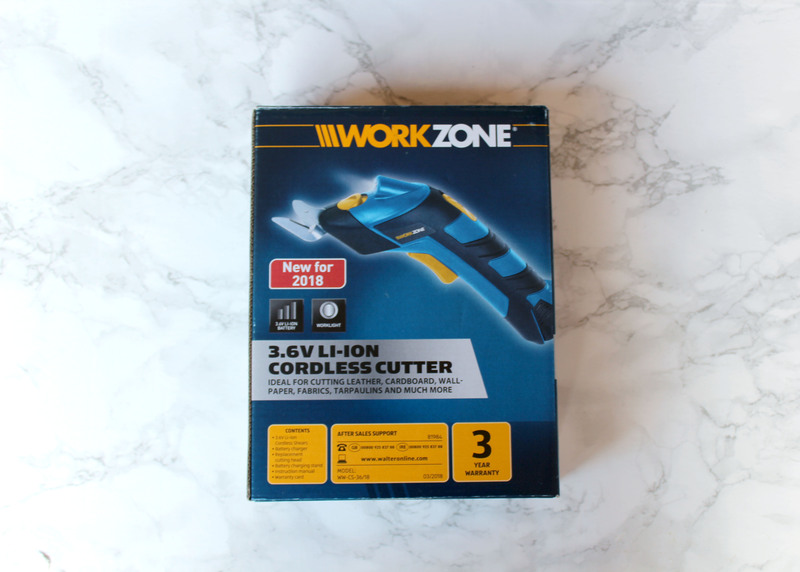 It was a quite fun to play around with the Workzone Cordless Cutter, but having tried it, we wouldn’t recommend it for everyday use. The noise was just too grating and it didn’t seem to save any time. We would only recommend buying yourself one if you have weaker hands that make cutting with scissors or a rotary cutter difficult. I hope you found our review interesting. If you’d like to be the first to find out about new tools or techniques, why not join our Rag Rug Community on Facebook https://www.facebook.com/groups/RagRugCommunity/or join our fortnightly newsletter here. This entry was posted in Rag Rug Supplies, Rag Rug Tools and tagged 2018, Product Reviews, Rag Rug Tools. Bookmark the permalink.